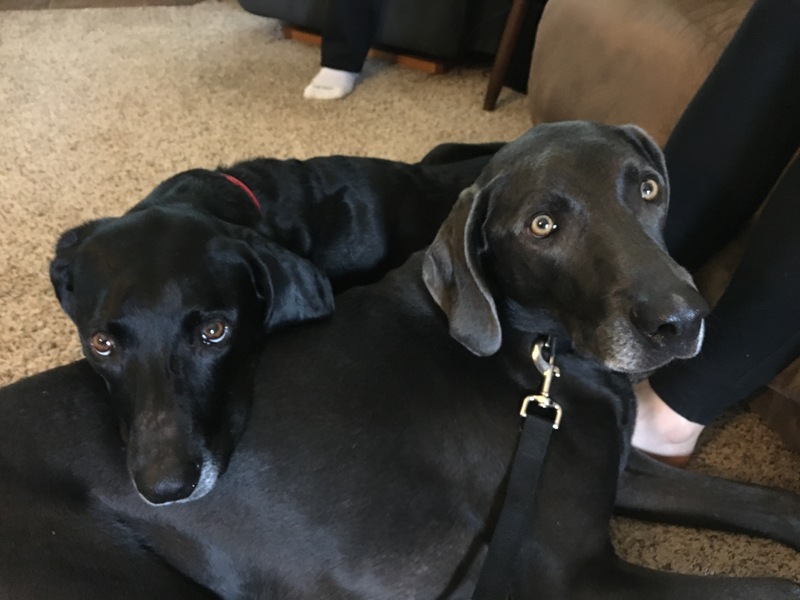 Axel and Dawz are a pair of five-year-old Lab Weimaraner mix brothers who were adopted separately from the humane society. Their guardians set up a dog obedience session with me to address Dawz Separation Anxiety and fear of the kennel along with Axel’s demand barking and overexcitement. The dogs got very excited as they saw me approaching the door, but once I stepped inside, they calmed down immediately. I sat down with the dog’s guardians to discuss what they want to do accomplish during our session. Little did I know that this information was about to be presented very clearly by one of the dogs. We call this behavior demand barking. It usually occurs in dogs who don’t have very many rules and are given what they want frequently. The best way to avoid demand barking is to immediately disagree with the dog when the behavior starts to show or to outlast the dog and not give in. But when you have a dog that barks as intensely and frequently as Axle does, that’s easier said than done. I suggested some rules that the guardians will need to start to implement in order for these dogs to start to identify as being in the follower position. It’s clear that before the session, the dog considered themselves equal to or superior in authority to the humans that they lived with. It also wasn’t hard to see where the dogs got this impression; every time they got near either one of their guardians, they instinctively reached over and started to pet them. I went over my Petting with a purpose methodology with the guardians so that they can start to add structure to rewarding their dogs. By only petting the dogs when they do something to earn it first, the humans can start to communicate to the dogs that they are in the leadership position. Once the dogs identify as being a follower position and respect the authority of their humans, then listening to the humans will no longer be optional. Early in the session I found out that the guardians were putting in extra effort to be fair with the dogs. If they were petting one dog and another came over, they petted both dogs. If one dog got a treat, so did the other. But when I am giving my full attention to one dog, and a second comes up and demands that I give it some attention, I’m allowing it to steal from the original dog if I comply. I suggested that they hold the second dog at arm’s length and continue petting the first dog for as long as they see fit. Once they finish, then they can turn and pet the second dog, provided it behaved well and did not bark or attempt to break free of their hold. I also recommended that the guardians start to follow through every time they give the dog a command. Many guardians don’t think much of their dog walking off and chewing on a bone when they are given a command to do something simple like sit or lay down. But if the dog does not listen to us when we give it commands, then why should it listen to us when we correct them? I suggested the humans start getting up and following the dog methodically when they fail o comply to an order, but not in an angry or excited way. If they tell one of the dogs to sit and it gets up and walks away, they get up and follow the dog. Once the dog finds itself backed into a corner, they should give the dog the command again in a stern voice. Once the dog complies, the human can go back to what they are doing. It’s important that we do this in a dispassionate way. Cornering an animal in a hunting or aggressive way can result in a reaction. But by methodically following the dog relentlessly yet calmly until it has nowhere else to go, and then repeating the command, the humans can communicate that listening to them is no longer optional. This also sends the message that the humans are going to follow through to get what they ask for. If the humans commit to following through this way for the next few weeks, the dogs will quickly start to obey much faster and on the first command. I always want to avoid repeating a command word to a dog over and over as this only demonstrates that the human is not serious about what they are asking. Next I showed the humans a way that they can incorporate a little bit of this strategy to treating their dogs. Throughout the session, Axle had engaged is demand barking multiple times. I wanted to give the guardians a way to redirect and focus him, so I tried out various techniques. Because he is a very high energy dog, this was very challenging. Most dogs need a good 45 minutes of structured exercise a day. Axel probably needs 3 to 5 times this amount of exercise. I would surmise that half of axles defiant behavior is a result of having just too much pent-up anxiety or energy. The guardians were aware of this and tried to use outdoor activities to burn this energy, but due to a number of allergies, this became problematic for Axel. I recommended that the guardians start to have Axle pull them on rollerblades around their neighborhood. I like to call this dog skiing and I have found no other activity that burns energy as quickly or as efficiently. But that still left us needing to come up with things to do in the house. I tried out a number of different techniques and exercises to try to focus Axle’s attention or distract him from his demand barking, but they had little to no effect. Eventually I decided to utilize a technique that was developed for hyperactive dogs called a reverse sit. We headed outside so that I could demonstrate the technique. Normally you move very quickly away from the dog, but this threw Axle off initially so I slowed things down until he got the swing of things. Once that was the case, I coached his guardian through the exercise. Dogs move much faster than humans do. Often times we are moving so slowly that the dog has an opportunity to look around for something else to do. I find this similar to people who read or send text messages while driving in slow traffic. We can only read or compose a text / check a FB, etc when traffic is going slow enough for us to multitask. But once traffic gets hectic, we no longer have the time to split our attention so we focus exclusively on driving. Note I do not condone people texting while driving. By stepping away from the dog in a rapid fashion, we do not give it the time to think about it or look for other things to get into. It simply has to respond. I had Axle’s other guardian take a turn at practicing this exercise as it is something that both guardians are going to need to do on a regular basis for the next few weeks. In the next video you will see the guardian running to the side. This is the more advanced move and I would prefer that the guardians practice the reverse sit exclusively for the first week before moving on to this unless Axel responds quicker than expected. Although we had only been practicing the exercise for a couple of minutes, I was quite pleased at how well Axle adapted to it. Seeing him looking up at his guardians face as she ran sideways was a great indicator that we had found the right technique. This is usually one of my favorite exercises, but due to Axles incredible amount of unspent energy and the dog’s perception that they had the same or more authority than the humans, it was much more challenging than normal. The guardians may want to practice this exercise with one dog at a time if they are unable to achieve the same results with both dogs simultaneously. I also recommended that they call or text one another one the way home from work so they can practice the exercise without the pressure of a real guest waiting at the door. We finished up the session by going over a kennel exercise with Dawz. Many people forget or don’t even think about training their dog to enjoy being in the kennel. This is often the case when people simply put the dog in the kennel and then leave. When addressing this issue, I like to have a dog practice being in the kennel while the humans are home. This way they are only dealing with one issue at a time. I tossed several high-value treats into Dawz kennel to gauge his perception of it. At first he was a little bit cautious, but it only took two treats before he was walking into the kennel voluntarily and without hesitation. Once this was the case, I tossed in another high-value treat and after Dawz entered his kennel. But this time I quietly followed behind him so that I was standing in the kennel doorway blocking his exit. I remained in place or stepped backwards one step at a time until we were able to get Dawz to sit down. Normally I would ask the dog to stay inside the kennel until it layed down but we were at the four hour mark in the session and I had to leave for a puppy socialization class I was holding after the session. It will be important that the guardians only practice this exercise when they have enough time to wait until Dawz lays down. This exercise is all about helping the dog practice staying calm inside the kennel. Because the door is not closed and the humans are right there, there is nothing for the dog to rebel or protest against. As soon as the dog takes a seat, the human needs to take a big step backwards, simultaneously. This communicates that the sit was what the human wanted. Once the dog lays down, it is communicating that it has surrendering to the exercise. At this point the human needs to immediately reward the dog by inviting it out of the kennel. I recommended that the guardians practice this exercise multiple times a day with Dawz. Once he is laying down within 15 to 20 seconds, then the guardians can move onto the next step; gradually adding more time before they give him the command to exit the kennel. By gradually increasing the time that we ask the dog to stay in the kennel, while simultaneously remaining in the room in the dogs view, we can help it learn to practice being calm inside of the kennel. Once the guardians get Dawz up to an hour with the door wide open, the next step will be to practice the entire routine again, but this time close the kennel door without latching it. By repeating this process with the door now closed but the human still in the room, we are helping the dog practice more realistic scenario. Eventually the guardians will be able to close the door and latch it as well as leave the room. I recommended that they do not leave the house until they are able to get Dawz to stay calm inside the kennel outside of his view for at least an hour, preferably two. Each dog is different, but once he gets accustomed to remaining calm inside of the kennel, the dog usually no longer has the burning desire to try to chew or paw their way to freedom. Once Dawes is comfortable staying inside the kennel with his guardians in the home for two hours even though they are out of sight, then they can start practicing leaving the house. Just like the kennel door open exercise, they will need to keep these initial departures very brief and gradually increase their link. Adding in a security camera which allows them to monitor the dog will assist them greatly. By the end of the session, both dogs were dog tired, LOL. Axle has stopped his demand barking and Dawz was becoming more comfortable inside of his kennel. It’s going to be very important for the dog’s guardians to consistently enforce the new rules and boundaries with good timing, pet their dogs with a purpose and master the reverse sit exercise. I hope the additional structure and discipline will help the dog start to adopt a follower’s mindset. Combined with aggressively ramping up Axles daily exercise, many of these unwanted behaviors should dissipate and eventually stop completely. That said, these dogs have some pretty intense issues. I have rehabilitated nearly 2000 dogs and only one session with only 13 clients needing a follow up.There is a good chance that Axle and Dawes guardians may be client 14.